Auckland, New Zealand not only features cruises to Australia and New Zealand, but also is a gateway to many of the greatest destinations in the world. Whether you want to stay ‘local’ or head off around the world, cruises from Auckland can take you there. Here are just five of the best cruises from this versatile port. 1. Crystal Cruises offers a Southern Summer Holiday tour lasting 16 nights and travelling from Auckland, New Zealand to Melbourne, Australia. With stops in several New Zealand ports, cruising the Dusky and Milford Sound and a three day stop in Sydney, this cruise showcases the best of two magnificent countries. 2. For cruises around New Zealand, Princess cruises has you covered with their 14 day excursion stopping all around New Zealand and ultimately ending in Sydney, Australia. Marvel at the sights in Tauranga, Picton, Wellington and other ports of call as you make your way to the beauty that is Sydney Harbour. 3. With lots of things to do in Auckland there will always be something to take your fancy as you wait to embark on your Holland America 33 night Grand Voyage. This cruise takes you to ports of call in New Zealand, across the International Dateline, to Papeete, French Polynesia, Bora Bora, Hawaii and Los Angeles to name just a few, and then cruises back to Auckland. 4. 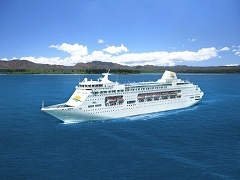 Cruises from Auckland can also take you to London, England or New York. Choose either a 39 or a 47 night tour aboard the magnificent Queen Elizabeth of the Cunard line and visit places such as Papeete, Bora Bora, Hawaii, Los Angeles, Mexico, Grand Cayman, Netherland Antilles, Fort Lauderdale, Florida, and many more, and then either stop in New York or continue on to London (Southampton). 5. If Indonesia has always been on your radar, Seabourn Cruises offer an Indonesian Odyssey tour, it cruises from Auckland and takes you to beautiful Singapore, with stops in Darwin, Celukan Bawang, Benoa, and Thursday Island, to name but a few. With so many New Zealand ports to consider, taking your cruise from this lovely country will take you to anywhere your heart desires. From the South Pacific with its pristine waters and sandy beaches, to the hustle and bustle of large metropolises like New York, London and Los Angeles, the world is your oyster when you choose cruises from Auckland, or any of the other ports in New Zealand.